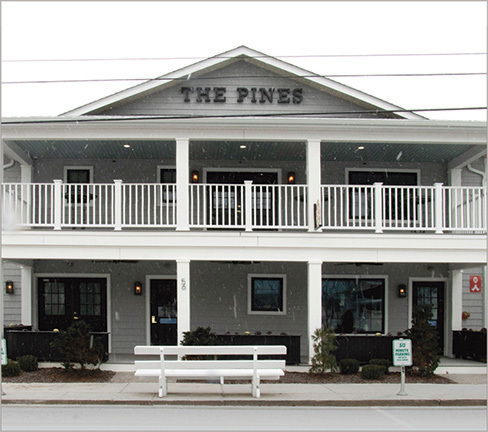 The news is absolutely great about The Pines, which finally opened on Baltimore Avenue for the past holiday season. The completely renovated historic beach cottage now houses a comfortable downstairs bar, a casual yet creative fine dining restaurant, an upstairs party venue and bar (The Top of the Pines), a balcony to overlook busy Baltimore Avenue, and to my mind, best of all, the fabulous New York/Ogunquit style piano bar. Painstakingly rebuilt, with an eye toward Rehoboth history (great old photos; beach artifacts) and a contemporary flair (the awesome wood tables were hand made for the restaurant from trees cut down in the area), The Pines' décor is a work of art. The Pines is the dream of Rehoboth area native Tyler Townsend, who followed a baseball-playing stint with the Baltimore Orioles to restaurant and hospitality school—and now to his own restaurant. He’s teamed up with business partner Bob Suppies, who also dreamt of opening a restaurant, and the project took off. Especially fun is the wall of old photos lining the trek upstairs. Some of the shots are historically amusing, with early 1900s beachgoers harking back to the turn of the 20th century and the following decades. Early Funland pictures and 1950s shots are amazing. There are also hysterically amusing shots of folks you might recognize having fun between the 1980s and now. I challenge you to find the joyous shot of the Gold Barbie-winning women’s troupe from the CAMP Rehoboth Follies show, now nearly two decades ago. Photos are fun, but it’s the food that dazzles—really dazzles—at The Pines. Chef Dane Wilfong has put together a creative and varied culinary selection. From the appetizers/small plates, the deviled eggs, tuna atop a salt block, and shrimp corndogs won my heart at an early happy hour visit. 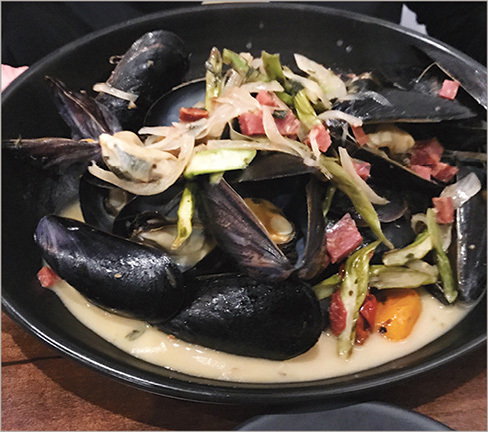 On returning for dinner, my wife Bonnie absolutely adored the Cataplana mussels—enough for a whole meal. 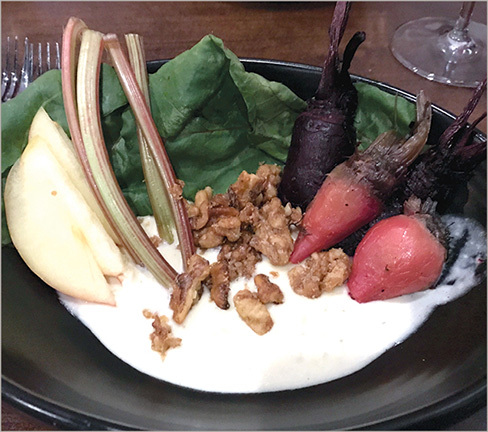 The roasted beet and gorgonzola salad, with pickled beet stems and honey crisp apple accompaniment, plus bourbon dipped walnuts, was as tasty as it was beautifully plated. Chef Dane knows his way around vegetables, taking special care to focus on taste as well as originality. We sampled two entrees. The Seafood Pot Pie, rich and brimming with scallops, shrimp, and fish under an ample flaky crust made a marvelous meal, with some to carry home. As for the Ginseng and Honey Brined/Grilled Pork Chop, simply bravo. It was huge, with delightfully moist meat, huckleberry compote to complement, and potent kimche carrots. I’d love those carrots dipped in a Bloody Mary. Other entrée selections include Seared Day Boat Scallops, Hibiscus Braised Short Ribs, a Butter Poached Lobster Roll, and an entrée for two, the Free Range Fried Chicken. We watched a table for two devour the fried chicken, proclaiming it the best ever. As for me, I cannot wait to try the burger on the sweet potato pretzel bun. As everything is made in-house (including the ketchup), so too was the dessert éclair—an ultra-rich frosted pastry with a dark chocolate center—a sweet and indulgent finish to a fine, fine meal. More in-house desserts are planned, along with tweaks to the menu and added photos for the memory wall on the way upstairs. Stop by for happy hour, dinner, or for the upstairs entertainment. And save some time to look at those photos. They are a trip back in time.